Charles James Tilsley was born in 1897 in Stoke-on-Trent to Frederick and Esther Tilsley. Frederick was born in Hanley and Esther in Cheadle. Esther died in 1900 and according to the 1911 Census, Frederick had remarried a woman called Mary in around 1903. Charles had two elder sisters and brother, Lilian, Mabel Lizzie and Frederick Arthur. In 1901, according to the Census, they were living at 22 Derby Street, Burslem and by the 1911 Census, 33 Heaton Terrace, Porthill. Charles is listed as being a ‘Hairdresser’s Lather Boy’. Charles’ army record, along with 70% of those from WW1, do not survive as they were destroyed during a bombing raid in WW2. 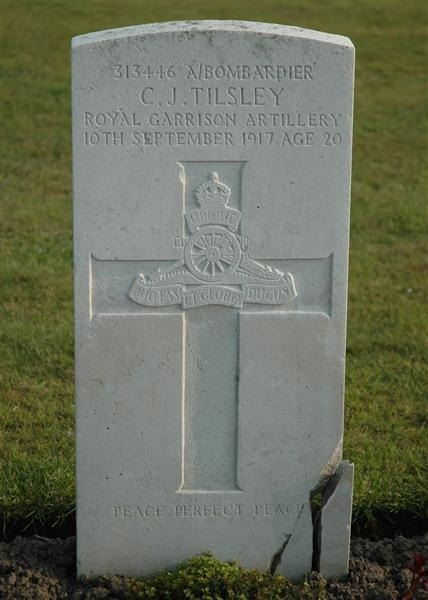 All we do know about his service is that when he was killed, he was Acting Bombardier Charles James Tilsley 313446, 2nd/1st (North Midland) Heavy Battery, Royal Garrison Artillery. 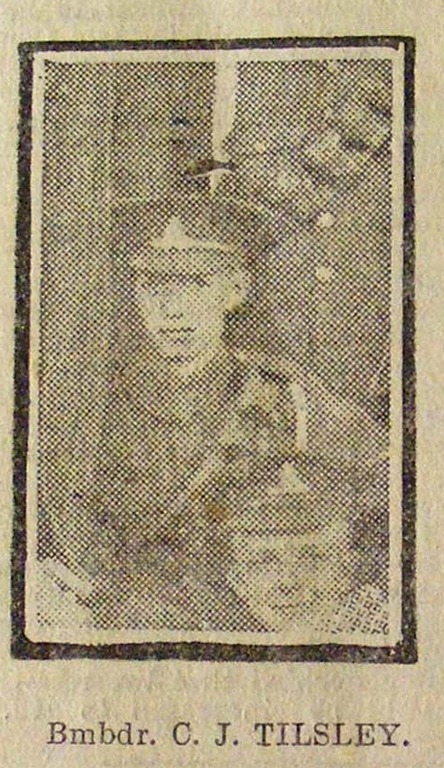 He died age 20 on 10th September 1917. Charles James Tilsley was awarded the British War Medal and the Allied Victory Medal. 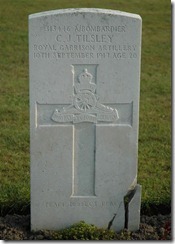 He is commemorated and buried at the Divisional Collecting Post Cemetery and Extension in Belgium and on our Memorial. At the time of his death, his family were living at 17 Sparrow Terrace, Porthill.